Diameter of Column                 8"        9 1/2"    13 7/8"   13 7/8"
to spindle centre           (max.) 32"       40"       48"       63"
(min.) 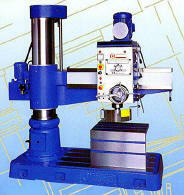 12"       12"       13"       13"
Travel of spindle head             20"       28"       35"       50"
to spindle end              (max.) 35"       40"       48"       48"
(min.) 9"        10"       13"       13"
Elevating height of arm            26"       30"       35"       35"
Spindle stroke                     6"        11"       12 1/2"   12 1/2"
Net weight                         2640 lbs. 3600 lbs. 6700 lbs. 7800 lbs.